A large, fast growing, and very ornamental species which is actually quite rare in cultivation. As with so many species of Phoenix, many plants lurking in botanic gardens or collections under this name are actually hybrids with little resemblance to the true Silver Date Palm, or, even worse, are simply misnamed Canary Island Date Palm. Its tall trunk is much more slender than the Canary Island Date Palm and its very full and dense crown has elegantly recurving, greyish, plumose leaves. 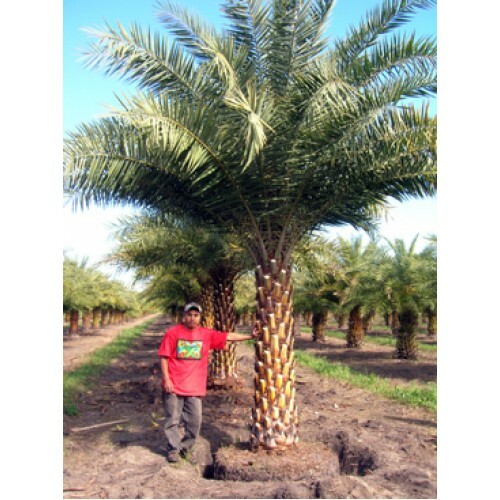 It is as easy to grow and will adapt to temperate as well as to tropical conditions.